We have been brushing our teeth since early childhood and little has changed over the years, so it seems, but advances in oral hygiene has made a significant difference to the quality of toothbrushes and toothpastes. In any new advancement, the tools are only as good as the person using them. So let's take a minute to go over the basics of toothbrushes, toothpaste and floss. 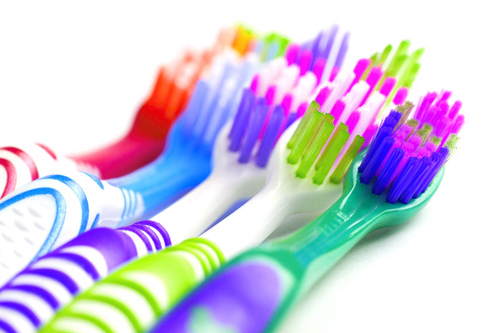 Selecting the correct toothbrush is extremely important. The toothbrush should have a soft ADA (American Dental Association) approved bristles. The toothbrush should feel comfortable in your hand and have a comfortable fit in your mouth allowing for you to efficiently and easily reach all surfaces of your teeth. If you prefer an electric model, there are many excellent choices-at our office and we love Sonicare. Sonicare has made a significant difference in the reduction of plaque and tarter leaving teeth feeling exceptionally smooth and clean. It's also excellent for maintaining and achieving healthy gums. Proper brushing requires 2 minutes twice a day including before bed in order to remove food and bacteria and sugars that will turn into plaque and tarter. A manual timer will help to insure the needed time spent. Do not forget to brush your tongue in order to scrape off bacteria that causes bad breath. Your gums play an important role in your oral health, brush along the gum line angling toward your gums. Remember to change your toothbrush or the head of your electric toothbrush every three months or after an illness such as a cold or other bacterial infection. We recommend that you select a toothpaste with added fluoride to help fight tooth decay. Finally, flossing in between your teeth will prevent plaque buildup. Proper flossing takes practice and the hygienist can help you with techniques for easy and efficient flossing. In doing your part at home, regular hygiene appointments and the increasing efficiency of toothpaste and toothbrushes will provide you with healthy teeth and gums for a lifetime.